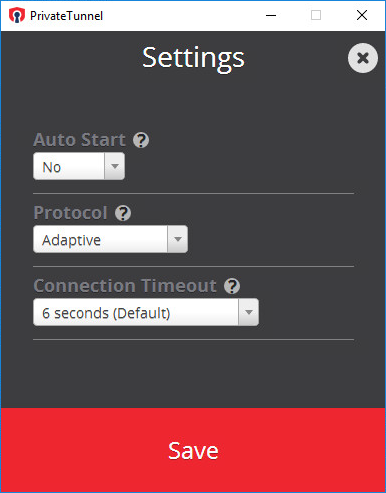 To change connection oriented settings on your PrivateTunnel, look for a wheel icon on the top right-hand corner, and then select Settings. The following dialog will appear. If you cannot find the wheel icon on your client, please update your client to the latest ones found on our website or in the respective app stores. Yes - Automatically start PrivateTunnel when your computer starts up. This will restore your previous VPN connection state to that when your computer has shut down or rebooted. No (default) - PrivateTunnel will start and connect on an on-demand basis. PrivateTunnel will not start up when your system starts up. Adaptive - Default option, attempts connection using the UDP protocol first, and then other protocols if UDP fails. UDP - Only attempt connections using the UDP protocol. You will not be able to connect to our service if outbound UDP port 1194 is not available on the firewall. TCP - Only attempt connections using the TCP protocol. You will not be able to connect to our service if outbound TCP port 443 is not available on the firewall. HTTP Proxy - Attempt to connect to our service using a relay HTTP service. This may work if you are behind a restrictive firewall, although the available bandwidth when using this option may be significantly reduced. OBFS Proxy - Attempt to connect to our service using a relay OBFS service. This may work if you are behind a restrictive firewall, although the available bandwidth when using this option may be significantly reduced. Generally speaking, the default 6 seconds timeout is sufficient for most systems and results in the fastest connectivity experience. On older systems or systems with a slower connection, however, the connection may not complete in the default timeout, and this may result in a connection loop. In these cases, raising the connection timeout value here may resolve this issue.